On Computers » THE END OF THE CREDIT CARD? Someday we’ll all use our smartphones instead of credit or debit cards, says Joy. A lot of techie types agree. Not bloody likely, says Bob. Why use a smartphone to make a payment when it’s no trouble at all to pull out a credit card? Credit cards are easy and free to replace if lost or stolen; phones are expensive. Bob says the cellphone payment wave will never become common; Joy says she can hardly wait. Visa’s Paywave software will come pre-loaded on the next generation of Samsung Galaxy phones. It lets you pay by waving your phone at a receiver on the counter. Mastercard’s MasterPass will be out this summer. If you just can’t wait for the “wave your phone” movement, there are existing apps that let you pay with your phone, such as Square Wallet. Other apps let you store your airline boarding passes, movie tickets, coupons, etc. 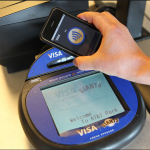 There’s Apple’s Passbook, and coming soon, Samsung’s Wallet.